What is UV Printing & How Does it Work? This month, Displays2go added a Mimaki UV LED Flatbed printer to our arsenal of custom printing solutions! So, we thought we’d take this opportunity to talk a little bit about what UV printing actually is, and why the addition of this printer to our production capabilities is so awesome for our customers. Essentially, what sets this flatbed printer out from the crowd is its UV curing technology. This type of printer will allow us to print directly onto materials like acrylic with record speed and incredible detail - all while maintaining the highest industry standards for environmentally responsibile printing processes! In this article, we’ll explain how UV printing works, what our UV printer can do, and why it’s a great choice for those seeking custom signage! UV printing is a form of digital printing that uses ultra-violet lights to dry or cure ink as it is printed. 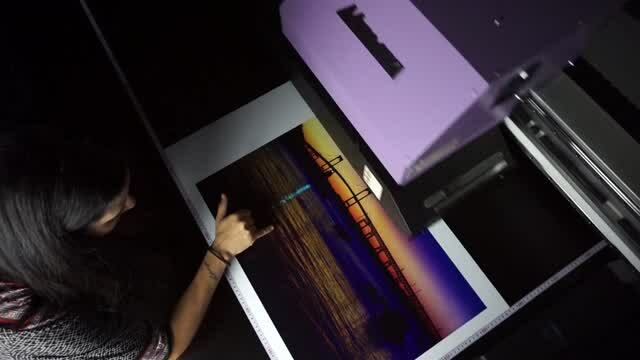 As the printer distributes ink on the surface of a material (called a "substrate"), specially designed UV lights follow close behind, curing - or drying - the ink instantly. Originally developed for quickly drying gel nail polishes during manicures, ultraviolet light applications quickly expanded into industrial and commercial markets. Because the UV lights cure any printed ink immediately, the dots of wet ink do not get a chance to spread out once printed, resulting in much finer detail. In addition, UV cured inks are weather-resistant and offer increased resistance to fading. This curing process is more environmentally friendly as it produces few VOC’s, odor, and heat. UV curing also allows the flatbed printer to be used with nontraditional materials like acrylic or aluminum. In fact, this UV flatbed printer is compatible with most substrates up to 2” thick! The introduction of the UV flatbed printer is a great addition to our custom production abilities. Displays2go’s current in-house printing capabilities include vinyl/digital heat press, silk screening, and solvent digital printing. The flatbed design of the UV printer allows us to produce the same high quality work as our solvent printers, only on thicker substrates! Our silk screening machinery does accommodate thicker materials, like acrylic, however these orders typically come with minimum order quantities which might not meet the needs of every customer. This same high quality output with added flexibilty makes the new printer a great companion to our current production abilities! UV flatbed printers feature some of the most up-to-date printing technology on the market today. By bringing this technology to Displays2go, we’re bringing the very best in custom signage to our customers. As a result, we are now the largest POS displays company with this printing capability in house. It's exciting stuff! While many smaller sign shops offer UV printing services, Displays2go is the only leading POS provider to bring this printing technology to a national audience. This makes us a one-stop-shop for any and all business displays you might need!